Here at Bury Golf Range we have Christmas covered this year. 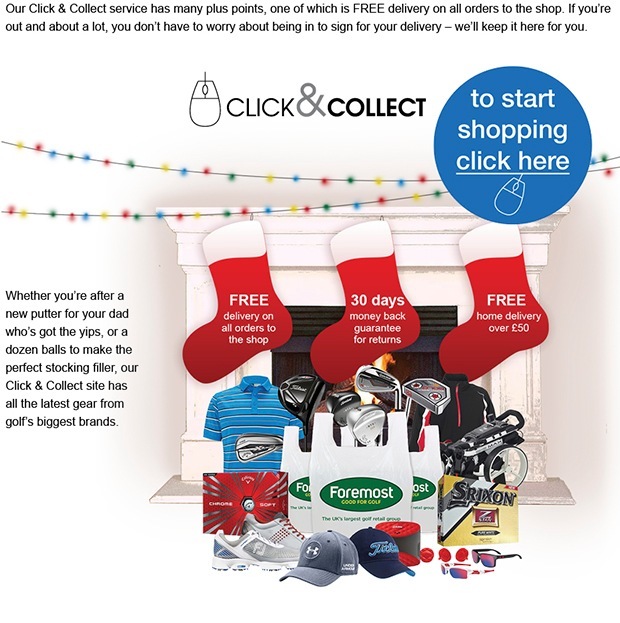 We have everything from stocking fillers to custom fitted golf clubs, so why not come and visit us in store and make the golfer in your family very happy this year. The Next Generation of Game Golf product has arrived. Game Golf Live lets you capture your stats in real-time, while you play, on your iOS or Android phone. Get seamless, real-time automatic game tracking through Bluetooth connectivity. Enjoy all of the features of Game Golf on the course or, leave your phone at the clubhouse and sync immediately post-round. The choice is yours. Take it to your regular Saturday game or use it in the next club tournament. Either way, you'll be knocking strokes off that scorecard in no time. As we have all know the golf course and the driving range are very different places, and at times it is hard to take driving form onto the golf course. The main area that people highlight to me is the changing levels on the course, whether it is that ball is above or below the level of your feet. So this month I have put together a short piece that will help you set up in these areas and give you a better chance to play the shot that is needed. The key to hitting good shots from an uphill lie is to make sure that at address your body is mapping (shoulders parallel) to the slope you are stood on. For an uphill lie my ball position remains the same as normal, but I will tend to aim a little right of my target as the ball has a tendency to fly right to left off this type of lie. I would also take one or two clubs more than normal, depending on the size of the slope. This is because the ball will be launched higher from this lie, and it's harder to transfer weight and power from this type of lie. Don't worry if you feel like you have more weight than normal on your right foot at address as remember you are trying to map the slope you are stood on. Just like with an uphill lie the most important aspect of playing a downhill lie is making sure you are mapping (shoulders parallel) the slope you are stood on. This would place a bit more weight on the lead foot than you would normally have on a flat lie. This set up position and lie will make me hit down more on the golf ball, so I will tend to place the ball a little further back in my stance more normal to help me achieve a solid strike. These well struck shots will launch lower than normal so I would take one or two clubs less this time as the ball will tend to run out more due to the ball flight being lower. Also shots from this type of lie will tend to go left to right in flight so I will aim a little left to compensate for this. Why not get the golfer in your life a Voucher either for lessons or the golf shop. Often, playing at this time of the year can highlight any problems you may be having with distance. The course will be playing longer, but if you're really struggling with getting the yardages you need through your irons set, then Wilson Staff's D200's should be on your try list.